When you combine the powers of an IRA with the knowledge and expertise of a real estate entrepreneur, the result can be an opportunity for tremendous financial growth. Do you know that a Self Directed IRA lets you to invest beyond the stock market? Many people are frustrated by low returns on their investment dollars. Five year CD’s are only paying less than 1% and the stock market has not had great returns since 2001! In response to this problem, we provide information on how using a Self Directed IRA can replace some of the low returns that you’re now receiving. According to the Social Security Board of Trustee’s 2006 Annual Report, the Social Security system will begin to run a negative cash flow by the year 2017, and by the year 2040 it will be completely insolvent! The total in unfunded liabilities for Social Security and Medicare in present value (or in today’s dollars) is $45 Trillion… the ENTIRE net worth of America is $42 Trillion! So what is this telling us? Very plainly, that we need to take our future into our own hands. We need to use our knowledge and expertise, coupled with the tools the government has given us, to not rely on Social Security as our safety net. You see, dollar-for-dollar, nothing provides a better return than loaning in a tax-free environment that retirement plans provide. Combine that with the solid, predictable growth that real estate offers, and you have a powerful mechanism to create high growth returns in a tax-free or tax-deferred environment. investing in distressed mortgage debt with your IRA. 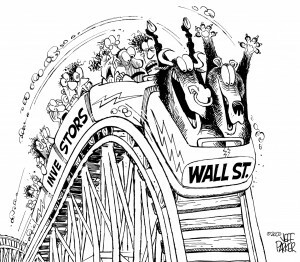 Most retirement accounts are invested in low-interest CDs or bonds that barely keep ahead of the inflation rate, or in the stock market which is highly volitile compared to other options, and may– or may not provide you solid, predictable growth. The overwhelming advertising by our financial institutions mask the fact that we can use our retirement savings, such as IRAs, 401(k) and other qualified plans, to provide loans for real estate. Investing with your Self Directed IRA can provide substantially greater returns for retirement than stocks or mutual funds. When you combine the powers of an IRA with the knowledge and expertise of a real estate entrepreneur, the result can be an opportunity for tremendous financial growth. By creating, transferring, or rolling over your investments to a truly self-directed IRA, you will have complete control over how these funds are going to be invested. Imagine being able to invest in a private equity fund, but gaining the added advantages offered by IRAs and their tax-deferred or tax free status. Most individuals don’t know this opportunity exists because most IRA custodians do not offer truly self-directed IRAs that allow Americans to place their monies in real estate and other non-traditional investments. Now w hat they really mean is that you can’t do this at their company because they have a vested interest in getting you to invest in their stock, mutual fund or CD products. They are not really looking-out for your best interest, they are looking-out for the best interest of their stockholders! A truly self-directed IRA custodian will not only allow you to invest in all forms of real estate (or other investments not prohibited by the Internal Revenue Service*), but will also handle all transactions within your IRA under your direction. Well, quite simply, it is. Click here to download IRS Publication 590 to learn more about for what you can and cannot use your retirement funds . As mentioned before, due to its tax-free/deferred status, a self directed IRA placed in Private Mortgages is one of the most powerful wealth-building tools available. But why is this? 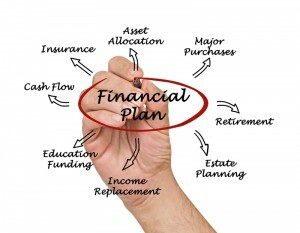 What benefits can an IRA offer that your present strategies cannot? There is no “work” involved when you put your retirement funds to work in a fund like Resolution Capital Management. Once the subscription agreement is completed and you invest your IRA funds, the annual returns allow it to grow on a regular, predictable basis. No tenants or contractors to deal with, no properties to maintain– just steady high-yield income. When you combine the advantages of a self directed IRA with our knowledge of the emerging real estate markets, using your IRA to invest with Resolution Capital Management provides you the ability to earn a higher yield tax free/deferred. The rate of return on your loan will be based upon the length and payout options you choose, not based on the ups-and-downs of the stock market! How do I Start Using My Retirement Funds For Buying Notes? For more info on getting started with self directed real estate IRA, visit the companies linked on our resources page. 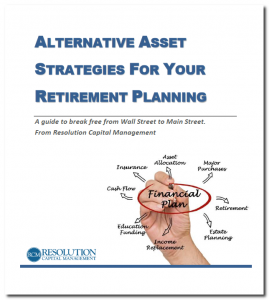 Complete the simple form below to obtain a copy of our latest guide, "Alternative Asset Strategies For Your Retirement Planning", which is an excellent starter guide for setting up your self directed IRA. The guide will be sent to this email address after you submit your request. DISCLOSURE STATEMENT: THIS IS NOT AN OFFER TO SELL SECURITIES. ANY PERSON, ENTITY, OR ORGANIZATION MUST FIRST BE QUALIFIED BY THE COMPANY AND READ ALL OF THE OFFERING DOCUMENTS AND ATTEST TO READING AND FULLY UNDERSTANDING SUCH DOCUMENTS. Resolution Capital Management LLC AND ITS AFFILIATES ARE NOT LICENSED SECURITIES DEALERS OR BROKERS AND AS SUCH, DO NOT HOLD THEMSELVES TO BE. THIS WEBSITE SHOULD BE CONSTRUED AS INFORMATIONAL AND NOT AS AN ADVERTISEMENT SOLICITING FOR ANY PARTICULAR PURPOSE. ALL SECURITIES HEREIN DISCUSSED HAVE NOT BEEN REGISTERED OR APPROVED BY ANY SECURITIES REGULATORY AGENCY IN ACCORDANCE WITH THE SECURITIES ACT OF 1933 OR ANY STATE SECURITIES LAWS.